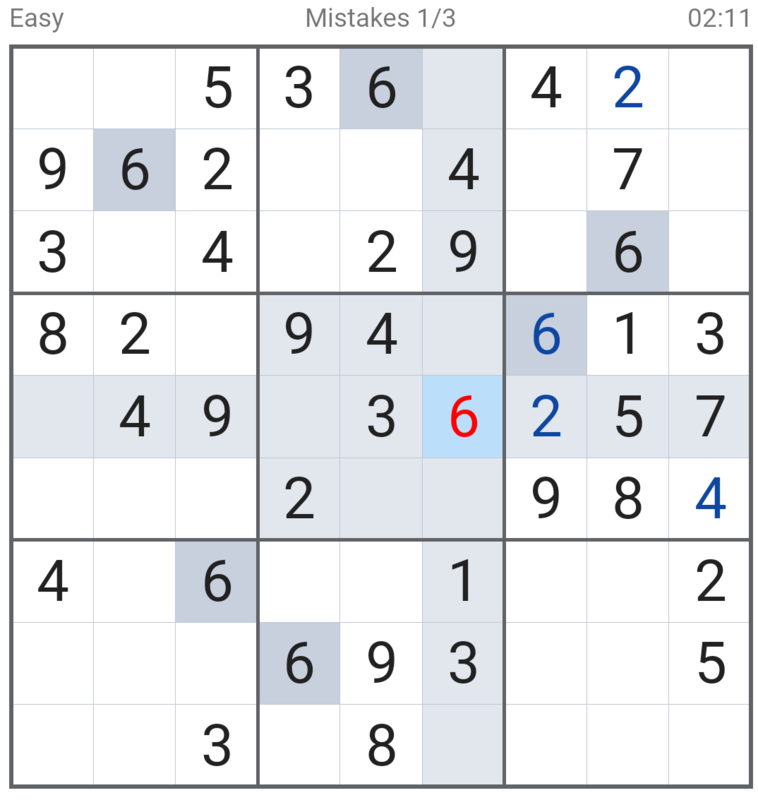 I'm new to Sudoku puzzles. I tried solving the one above but my last move was flagged as a wrong move(highlighted red). I believe it is a false positive since the $6$(highlighted red) I inserted is unique on the rows and columns as well as within the small square. Can someone justify this for me? When solving Sudoku puzzles, you don't put the numbers where they might be, you only put them where they must certainly be. Deduce, eliminate possibilities, find restrictions on options, but only when you are certain, put the number in. Or even more clearly: You never have to guess in sudoku. Based on the current values above, within the center set, 6 can only be placed in either the right center or right bottom locations. However, you are not far along enough to 100% determine which of those two locations are correct yet. Rather, through elimination and evaluation both are still feasible. Based on the fact that the application flagged the right center location, once you are far enough along it is likely that the right bottom location will be determinable as the correct placement. If you'd like me to explain why the right bottom location is still valid for 6, let me know. @ABcDexter made me realize something I forgot to mention, so I'll elaborate on what they stated. Maybe you already are aware but I'll mention it just in case: Just because a number looks like it can go there at the time, does not mean it will in the end. Remember, there is only 1 solution to any properly given Sudoku puzzle, meaning you must be certain (or have a lucky guess) as to where a number will be placed. If you solve the middle blocks, then something like this comes up which eliminates the $6$ from the cell you just entered. Also, as Dorrulf mentioned, there are two possibilities for 6 in that 3x3 block and you need to be absolutely certain before putting a number in the cell. "I believe it is a false positive since the 6(highlighted red) I inserted is unique on the rows and columns as well as within the small square." The digit 6 is not found in the columns, rows or enclosing 3x3 square. That much is true. The problem is that "not found" does not mean "unique". It would be unique if it were the only digit which is not found. However, that is false; the digit 8 is also not found. Without filling in more squares elsewhere and making other deductions, the best deduction we can make about the square is that it can contain either 6 or 8. We have no justification in asserting that it is one or the other. You can easily convince yourself of this. Consider all the digits from 1 to 9 and substitute them into that position. For each one you will find a row, column or 3x3 conflict, except 6 or 8. Of course, the idea that the square contains 6 or 8 critically depends on the assumptions that everything has been filled in correctly so far. That assumption is justified, because, I suspect, the software is revealing to us all squares that do not match the solution. That 6 is the only wrong one, and so the only other possible value, 8, is the right one. Note that every (correctly generated) Sudoku board has exactly one solution. Therefore, Sudoku programs can trivially check all your moves simply by comparing their values to the board's solution. When incorrect values are flagged, the software is not considering any nuances in the quality of your reasoning, only the concrete output. Having exactly one solution means that if you fill any square with a value other than the uniquely correct one, even if that value doesn't cause an immediate conflict, you will not be able to finish that board. A conflict will eventually appear. It could be as late as the very last value. One square remains and you see from the horizontal row that it must be a seven! You fill it in and then you realize, oops, the column already has a seven. At advanced levels of Sudoku, the boards are not solvable as a sequence of deductive moves, each made with perfect certainty and finality based on the previous moves. Tough Sudokus require a guess to be made at some point. Perhaps even two guesses. You know that some square must be 4 or 7, but there is no way to decide, and no other moves can be deduced. So you must choose one or the other and proceed; then if you run into a conflict, you must backtrack: erase that guess and all the later steps which depend on it, and try it the other way. Edit: whoops disregard this. I obviously haven't had my morning coffee yet. To prove that the 6 is incorrectly placed, we only need to prove that the sudoku is unsolvable if the 6 is placed in that location. After placing the 6, we can see that row five is still missing a 2 and an 8, but neither of these can be placed as the first number of this row as there is already a 2 and 8 in the center right box. Thus we can say that placing the 6 where you put it will make the puzzle unsolvable and is therefore not the right place to put it. It is immediate to see that in the left center block the 3 must be in the bottom center square, then the 5 can only go in the lower left corner, and then the 6 can only go in the left center square. So "your" 6 is indeed wrong in the center right, it can only be in bottom right. As others said before, even if you can place a number without having the same number in the same column, row or 3x3 block, is not always a correct move. You must be sure that the number cannot be placed anywhere else in that column, row or 3x3 block. What you will find, if you continue working the puzzle with the 6 there, is that it will force a contradiction later on. From the 4's in TC, MC, and BL, 4 must be in the bottom-left square of the BC. From the 2's in TC and MC, 2 must be in bottom right of BC. From the 6's in TR and RC, 6 must be in bottom left of BL. From the 5 in TL, 5 must be in upper right of MC. There is now only one open space in the top row of the middle blocks, which must be a 7. From the 8 in LC, 8 must be in the middle right of BL. There is now only one open space in the right column of the left blocks, which must be a 1. From the 1's in ML and MR, 1 must be in middle left block of MC. And NOW we run into a problem. We need an 8 somewhere in MC, but the only spaces available are in it's bottom row. But we can't put an 8 there because there's already an 8 in the bottom row of ML. The point is, the puzzle 'knows' where the 6 is going to be put, but you don't. Checking the possibilities for as far as you have progressed in solving the puzzle, it can go at (5,1) or (6,1) and at (5,6) or (6,6) with the notation (row, column). If you already position the 6 at this stage you're just guessing. It could have been either (5,6) or (6,6). You guessed (5,6) and the puzzle knows already that it's the wrong bet and lets you know it by flagging it red. Not the answer you're looking for? Browse other questions tagged sudoku or ask your own question. Are there published Sudoku puzzles that require guessing? 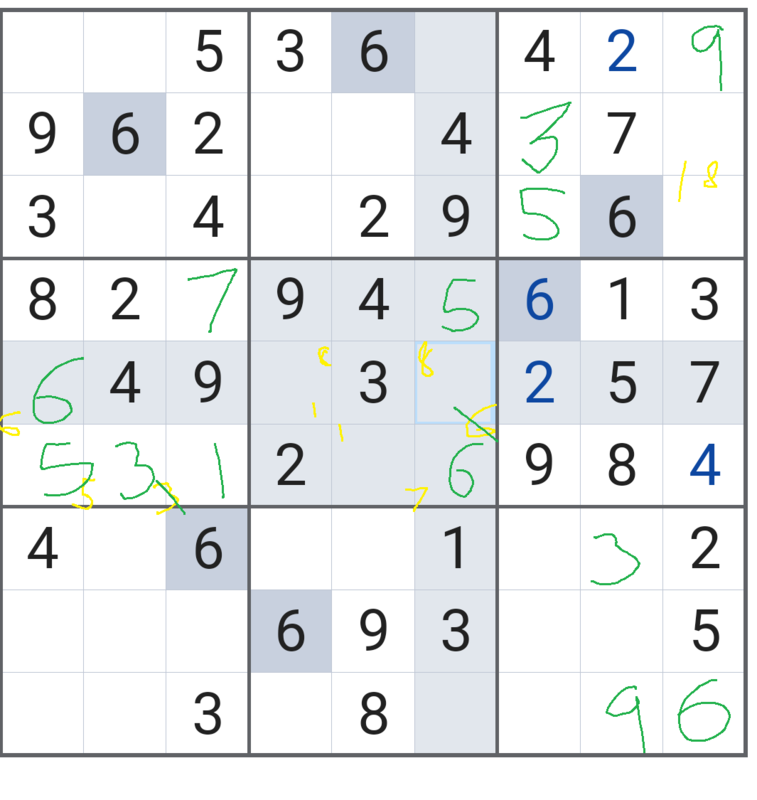 Sudoku Puzzle, What's My Next Move and Why? What is wrong with this Sudoku Game?